Translational Research, Innovation and Scaling (TRIS) in MasterPlan 4 in Education ICT information and communication technology mp4 seeks to nurture a culture of innovation and reflective practice across schools. To do so, it is important to engage schools and teachers in experimentation and innovation efforts such as OER@SG and OSP@SG. This will allow teachers to engage in professional discourse (through discussions on each OER article), learn, reflect and explore together, deepen their practice and improve their craft. Through translational research, successful evidence-based practices (see OSP@SG research page) will identified and scaled up to benefit other schools in the system. Scan for educational technology-related issues, promising applications and themes (see OER@SG pages) of relevance to Singapore education system to inform stakeholders. Spread successful practices developed through the innovation projects, by making them available for all schools to adopt and adapt (thus harnessing OER, an UNESCO initiative since 2003, is one way to achieve this). accessible ( no password nor login required, download and use, heighten chances of adoption of educational resources and practices ). Browse the collection to view thumbnail images.Double-click on a video to open it in Tracker. Loo Kang Lawrence WEE is a senior specialist II at the Ministry of Education (MOE), Education Technology Division (ETD),Singapore. He obtained his B.Eng (Hons) from National University of Singapore, and his Masters in Instructional Design and Technology from National Institute of Education, Nanyang Technological University. His current research focuses on designing computer models, also known as simulations and video analysis and modelling for physics education. He is a member of American Association of Physics Teachers (AAPT) and International Research Group on Physics Teaching GIREP and also publishes in Physics Education journal. 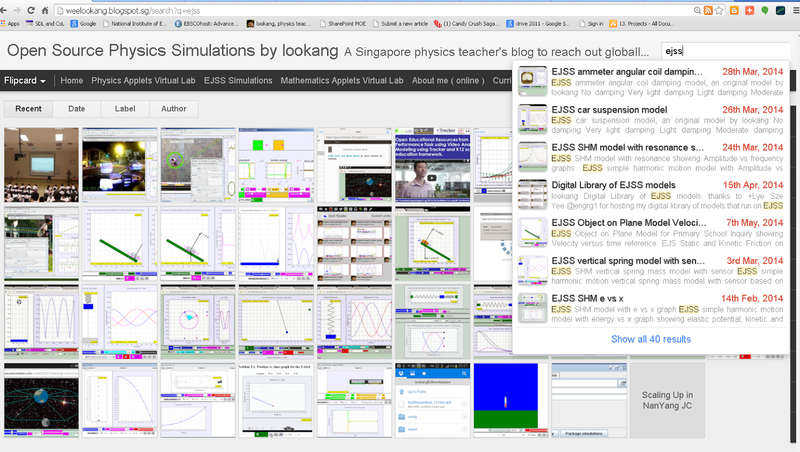 His blog http://weelookang.blogspot.sg serves as a gateway to teachers and students to use and remix his simulations with the aim of benefiting all humankind. 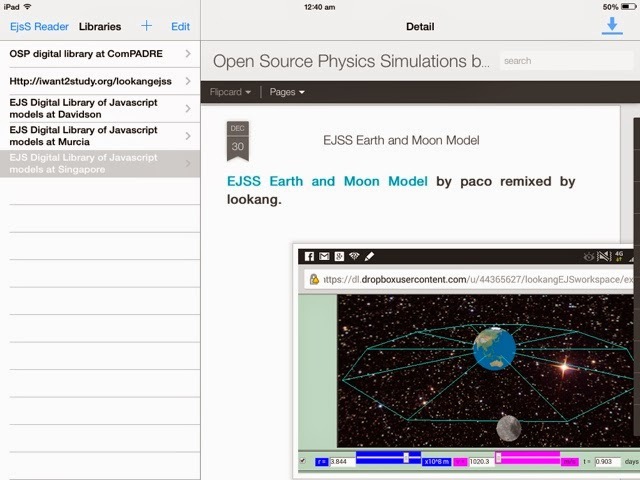 His contributed simulations are downloadable, creative commons attribution licensed, from Digital Libraries on the NTNU Virtual Physics Laboratory and Open Source Physics (OSP). His teaching experiences include junior college physics and secondary school science and mathematics. He was recognized for his research and development of innovative and effective “gravity-physics by inquiry” computer models by winning a Ministry of Education Innergy 2012 Gold Award, Singapore Public Service PS21 Best Ideator 2012 and Ministry of Education Best Innovator Award 2013 . He is also a recipient of numerous SPRING Singapore Excellent Service Award (EXSA), MOE Service Excellence Award (MSEA) and PS21 Distinguished Star Service Award 2014 .
currently, the host is http://iwant2study.org/lookangejss/ is a personal server by @engrg1 Lye Sze Yee. Thanks a million for hosting! 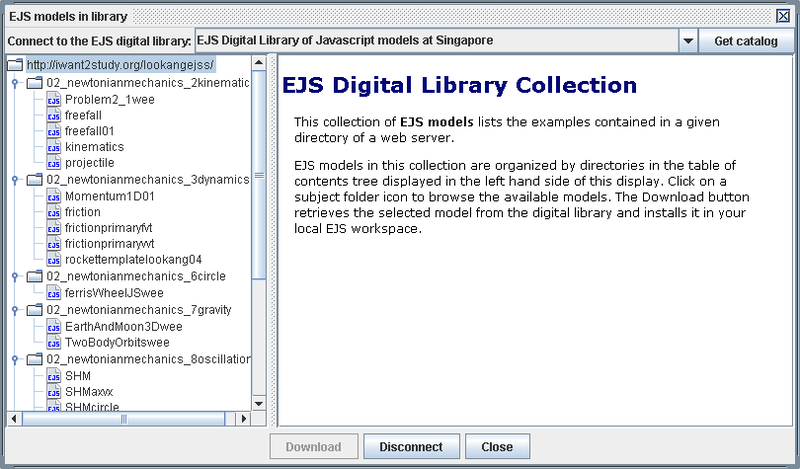 All ejs and ejss, trz models are copyrights of the respective authors, we ask that you attribute them individually to respect their copyright, creative common attribution. Any opinions, findings and conclusions or recommendations expressed in these materials are those of the author(s) and do not necessarily reflect the views of the Ministry of Education, Singapore, National Institute of Education Singapore nor National Research Foundation Singapore.